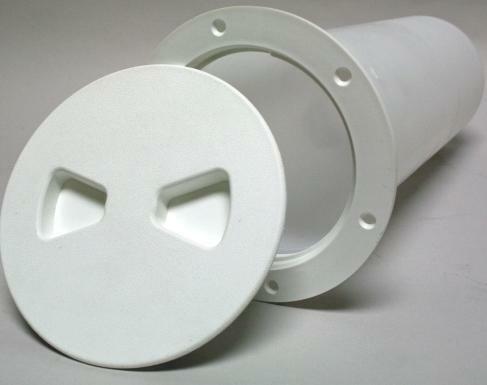 Versatile PVC storage tubes mounted onto our watertight Sure-Seal™ 4" diameter deck plates give the boater protection of valuables that would be damaged by moisture. Great for cell phones, keys, wallets, flare kits, nautical charts, etc. Provides watertight storage in tight areas. Can be mounted vertically or horizontally. Available in three convenient tube lengths (8", 12", 27") and three Sure-Seal™ deck plate colors (black, fish white, sand shell). Available with Marinco female 12V power plug in 8" and 12" models to provide convenient cell phone, iPod, and GPS power.